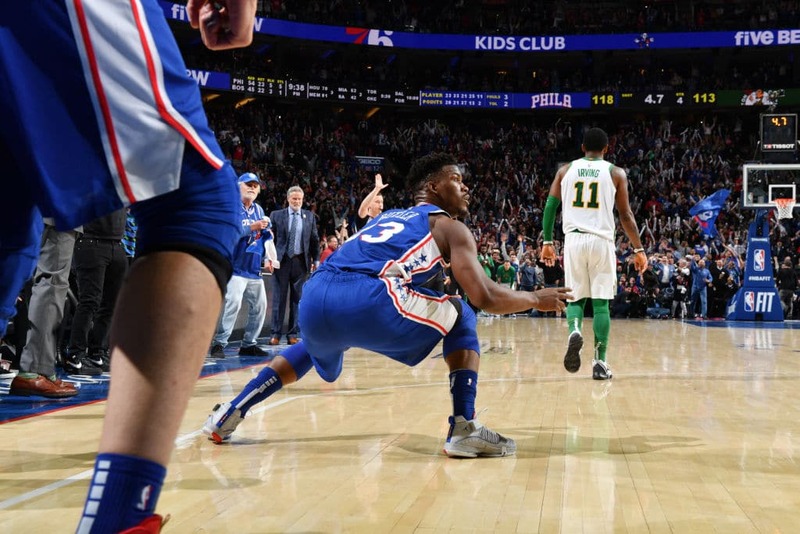 The Sixers just couldn’t get over the hum against the Celtics. They were dominated by Boston in the season-opener. Their second game, Kyrie Irving took over in the clutch to take them down again in OT. In their third meeting, Gordon Hayward came up clutch to put the Celtics within one win away from a season sweep. Early in their fourth meeting, it looked like the Celtics were on their way to getting the sweep. Boston jumped out to an 11-point halftime lead. Joel Embiid had enough. Early in the third quarter, Joel Embiid set a hard screen on Marcus Smart that sent the Celtics guard to the floor. Smart retaliated with a blindside shove on Embiid. That earned Smart his an automatic ejection from the game. But that incident also lit a fire in Embiid. He dominated the next possessions, scoring eight straight points to pull the Sixers to within four points. He literally carried his team back into the game with his incredible, powerful game. Embiid finished with 37 points on 20 free throws and 22 rebounds. The game was tight all the way to the end. Embiid got a big block in the final seconds that led to the dagger by Jimmy Butler. The Sixers got the ball after Embiid’s stop and handed it to their closer. Butler was isolated on the right wing against Irving. He tried backing Irving down but Boston’s leader stood his ground. Butler lost the ball and Irving tried to complete the turnover with a steal, but Butler got it back and was suddenly wide open. He knocked down a jumper that gave Philly a five-point cushion. He also had this priceless reaction to his clutch shot. Philly had a lot of heroes on today’s game. The entire starting five came to play. Embiid was a monster, Butler was clutch, Simmons and Harris also had big games while Redick was steady. The Sixers are peaking at the right time just like last season. They’ve now won five straight games to take full control of the third seed in the East. OKC was celebrating one of their most loyal players. They retired Nick Collison’s number during their game against the Raptors with former Thunder players Serge Ibaka and Kevin Durant in attendance. It seemed like the Thunder were going to pull off a shocking win against the visiting Raptors on this special night. Midway through the fourth period, the Raptors were in full control, leading by 14 points. That’s when the Thunder made their run. Paul George and Russell Westbrook led the comeback with crazy clutch shots. Westbrook tied the game with a pull-up jumper with 4.8 seconds left in the game. Unfortunately, the Raptors turned on their defense in OT. They shut down the Thunder offense in the extra period as Kawhi Leonard, Marc Gasol and Fred Van Vleet put the game away. The Spurs, as always, are all class. In Dwyane Wade’s final game in San Antonio, the team had a special tribute for Wade before the game. And then Gregg Popovich handed a nice gift to Wade before the game started. The gift was a set of signed jerseys by Tim Duncan, Tony Parker and Manu Ginobili. The Spurs might not be championship-level right now. But they’re always champions when it comes to class.